I think this recipe is the fastest read to bake ratio on the blog yet. Joy the Baker blogged this lovely recipe on Thursday and I was in the kitchen making them on Sunday. I think I would have been quicker had my car not broken down on Friday (I’ll save moaning about that for my Twitter account!). I’ve been searching out the Peanut Butter Co. peanut butter for a while. They are based in New York and make natural peanut butter without all the scary preservatives and palm oil that most producers use (even brands made in the UK which doesn’t use as much palm oil as the States). Sainsbury’s stocks the smooth peanut butter, they have lots of different flavours (cinnamon raisin swirl! dark chocolate dreams!) so I am hoping they get more popular here and start stocking more. These cookies are so great, I always have success making oaty cookies and these were no exception. 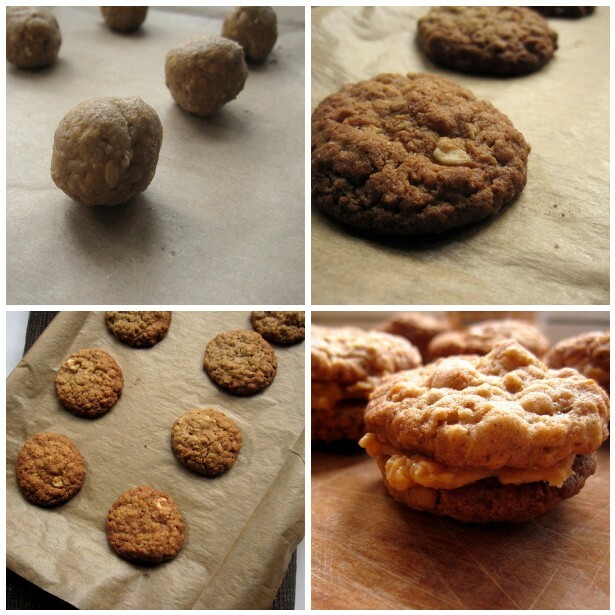 They have tons of flavour, lots of crunch from hazelnuts and that amazing peanut butter filling. I used a touch less sugar in both the cookie mixture (2/3 cup) and added icing sugar to taste, I don’t like cookies too sweet as I like to taste the rest of the ingredients. I made up the whole batch of dough according to the recipe, but only baked half, I saved the rest and froze them in little balls in the freezer – ready for future cookie cravings! I do this a lot with cookies as we can’t eat such big batches ourselves, and it is nice having cookie dough in the freezer. I made half the icing for my half batch of cookies. From Joy The Baker, makes about 24 cookies. Preheat the oven to gas mark 4 / 180c. Cream the butter and sugar in a large bowl or mixer, add in the egg and mix to combine, add in the vanilla extract and combine. Mix the oats, flour, baking powder, salt and spices in a separate bowl. Then adding a bit at a time fold in the dry ingredients with the butter mixture. Be careful not to overmix. When it is all incorporated stir in the nuts. Prepare a flat baking sheet by lining it with baking parchment. Scoop out teaspoon size bits of dough, roll into a ball and place on the sheet 1.5 inches apart. Bake for 10 minutes for soft chewy cookies and 13 minutes for crispier cookies. Bake in batches if you don’t have room. Put the butter, peanut butter and vanilla in a bowl and cream together. Add the icing sugar in batches. I added in half first and mixed, tasted for sweetness and added more to taste. To get a creamier icing that is spreadable add in splashes of milk to the icing. When the cookies are cool enough (leave in the tray for 5 minutes and then cool on a wire rack for 10 – 15 minutes) spread the icing over each underside of the cookie and then sandwich. Place in mouth. Place another one in your mouth. Make a cup of tea and dunk that cookie in it! I’m really quite smug that I have another 12 cookies to be in my freezer.